Let’s take a look at some of the biggest stories from this week, including Temple Fox promoting new financial literacy initiatives. A Temple University Fox School of Business MBA alumnus has made it his goal to promote financial literacy through a new non-profit startup. Thomas McDevitt, MBA ’02, formed Philly Financial Planning to offer underserved communities the tools to make informed financial decisions – tools which have not been available to these communities in the past. Philly Financial will seek to partner with various organizations to promote their cause and to implement programs. McDevitt said, “Philanthropists, faith-based organizations, local government officials, community and neighborhood leaders, … corporations, learning institutions, and financial [institutions] can all play a meaningful role in helping us to achieve our long-term strategic goals of closing Philadelphia’s wealth gap”. In conjunction with Philly Financial, McDevitt hopes to form ‘The Eagle’s Nest’, a Shark Tank style competition series geared toward inner city entrepreneurs. Education on financial matters has been McDevitt’s focus since his time at Fox. He formed McDevitt & Kline, LLC, with another Fox alum, Dr. Bill Kline, to offer continuing education to attorneys and CPAs. The University of California, Berkeley Haas School of Business will host the 5th Annual Africa Business Forum, entitled “Africa on the Move: Enabling Homegrown Innovation,” on April 6, 2019. The factors at work in Africa such as rapid growth and a youthful population make it appealing for existing companies and startups alike, as well as for investors. Of utmost importance to the chairs of the conference was focusing upon ways in which policymakers and leaders of business can support the growth of economies in the most beneficial and responsible ways. The conference will be comprised of panel discussions, keynote talks, and a hackathon on public policy innovation. Among the forum’s guests will be Andile Ngcaba, founder and chairman of the investment group Convergence Partners; Benjamin Fernandes, founder of fintech company NALA; and Nichole Yembra, founder and managing director of The Chrysalis Company. Rutgers University Business School and the Supply Chain Management Association (SCMA) have joined forces to grant MBAs assistance in receiving their Supply Chain Management Professional (SCMP) designation. 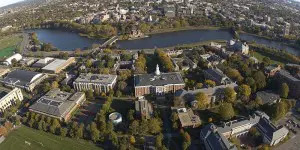 Harvard Business School recently joined the Leadership Circle of sustainable agriculture non-profit Farm Forward. Farm Forward works to promote awareness and access to food options that support humane treatment of animals and responsible farming practices. HBS joins Villanova University, UC Berkeley, and 12 other organizations as an institutional partner. The relationship with Farm Forward is part of a growing effort by HBS to implement sustainable practices across campus. Its alignment with Farm Forward will result in procurement of food products that are from certified organizations, along with the introduction of more plant based foods on the menus of the campus’ dining halls. Both dining halls are certified by the Green Restaurant Association, and leftover food is donated to Food for Free, which donates to shelters or to others in need. The University of Texas McCombs School of Business and Moody College of Communication will partner with Blue Cross Blue Shield of Texas to conduct research on administration of adult vaccines in two Texas counties. The $500,000 grant will help advance research on issues that result in the ever rising cost of healthcare. The study, “Improving Adult Vaccine Delivery by Optimizing Clinical and Health IT Processes in Austin/Travis County, Texas” will be led by Dr. Leanne Field, a clinical professor at the College of Natural Sciences and director for Digital Health Care Innovation at McCombs. The research team hopes to implement their findings to improve access to vaccines and other interventions at a lower cost to the consumers who most need them.